John Beck and Matthew Cornford have been tracking down and photographing the sites of British art schools for around five years. While many towns in the UK used to have a dedicated art school, now there are only a handful left; most of the buildings have been repurposed or, in some cases, demolished. This 48pp book, published by Kingston University’s Centre for Useless Splendour, is the latest bulletin from their ongoing project. 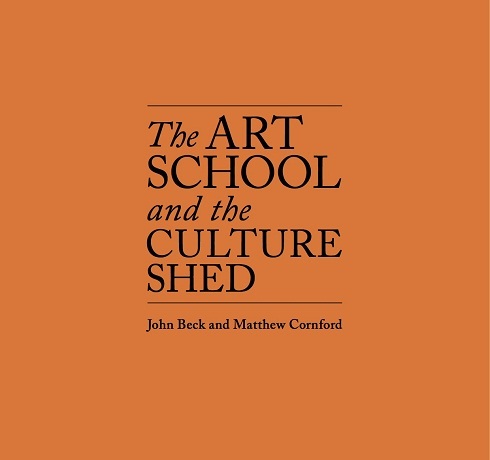 While there is a historical side to Beck and Cornford’s investigations that seeks to situate the history of art education in the UK within a broader cultural history (the massive impact of art school education on postwar British culture, for example), there is also, the book argues, a contemporary relevance to seeking out old art school buildings. Instead of educational institutions dedicated to the study of art and design, British towns are now more likely to contain signature gallery and museum buildings intended, in part, to contribute to local regeneration, heritage, and/or tourist agendas. What does the decline of the local art school and the rise of the ‘destination’ art gallery tell us about changing ideas about the function of art, its possible civic purpose, and the relationship between participation and spectatorship? What can old buildings tell us about new ones? How did the ‘creative economy’ come to replace ‘art school’ as a descriptor of local cultural value and why does it matter? The book, introduced by Dean Kenning, includes 20 colour images and an edited transcript of a talk By Beck and Cornford delivered in 2012 as part of Kingston University’s Stanley Picker Public Lectures on Art series.